Dial your way to keeping touch with friends and family. It's the perfect accompaniment to our vintage phone. 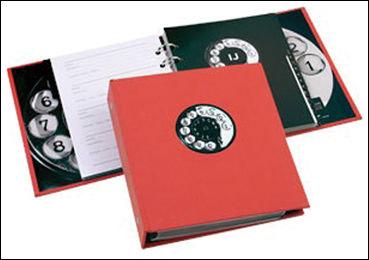 Original "dial" graphics on the cover and each letter page evoke the olden days, but the refillable sheets are up to date and allow you to write down address, phone, cell phone, fax and email. It combines the best of new and old in your choice of basic black or hot pink. 4-ring binder, cloth cover, 166 pages, 6-1/2" X 7-1/2" H.